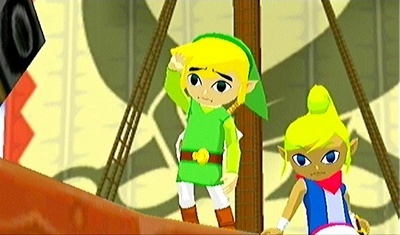 Zelda Wii Teaser Trailer Shown, Zelda Wii to be Cel-Shaded? This is merely a rumor and our crew at E3 has not been able to confirm it, but reports are flying around the net right now that there was a Zelda Wii Teaser Trailer shown to private media yesterday to increase excitement for Nintendo’s conference today… and to many people’s surprise Zelda Wii was Cel-Shaded, showing extremely crisp TWW style graphics with an adult version of Link. Naturally, since our crew could not confirm this (remember, we are at E3), chances are this is false, but we’ll know soon enough. Less than 6 hours remain. Just keeping everyone updated on the last minute “rumor mill” before it hits. Originally found at Hyrule.net.